The San Jose Blog: Developer proposing a 10.5 million SQFT project in Santa Clara with a 50-story skyscraper! Developer proposing a 10.5 million SQFT project in Santa Clara with a 50-story skyscraper! The tallest project in Silicon Valley history was just proposed--to the Santa Clara City Council. While not in San Jose proper, this would have a tremendous impact on San Jose as it would push forward what is considered acceptable vertical development in the metro. This behemoth project by Chinese developer Kylli would clock in at 3.5 million SQFT of office, 400,000 SQFT of Amenities, 6 million SQFT of residential (~6,000 units), 600,000 SQFT of retail, and around 8 acres of open space. As you can see from the drawing below, it would include nearly two dozen towers, with the tallest being a 50-story office building which at 600 feet would be twice as tall as anything in Downtown San Jose. Despite totaling 10.5 million SQFT of development, it would utilize less than 50 acres at the former Yahoo campus. To put that in perspective, Related's 9.1 million SQFT mixed-use project across from Levi's Stadium will use 240 acres. What Kylli is proposing really should be the level of density we look towards in future projects if we plan to build enough housing to keep prices at bay and enable communities where you can work, live, and play without needing to drive. While I would have much rather seen a project like this proposed for San Jose proper, I have to root for this to go forward and hopefully motivate our city to follow suit with similar projects. 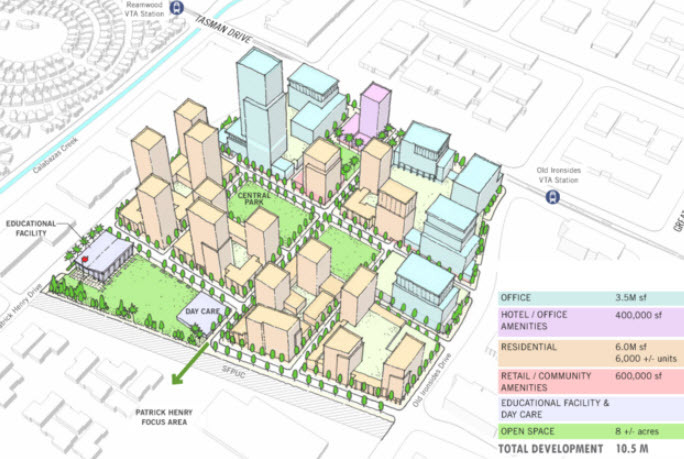 Google will be a gamechanger for Downtown, but we need to start looking at other parts of the city (not limited by the airport) where we have the opportunity to build extremely dense world-class villages. Think Bigger San Jose has a similar perspective on this project. This will surely be a proposal we'll keep close tabs on!